We’re always impressed when a new way of doing things comes along and revolutionises a lengthy process and one which is costly. Lock-Block Ltd, a construction material production company, has come up with a new way of building tunnels, which can be used as pedestrian passageways, wine cellars, weather shelters, and more. Their Zipper truck enables these tunnels to built very quickly. 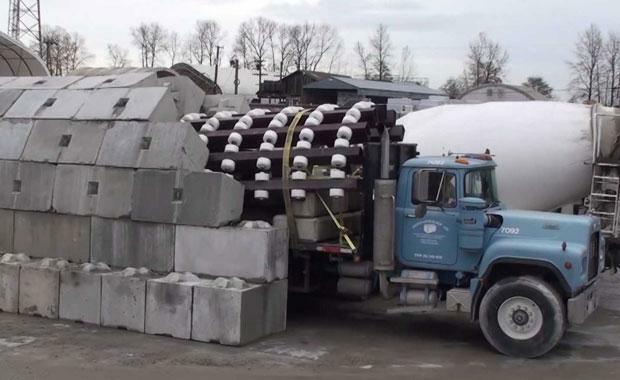 It uses pre-made concrete blocks that fit closely together as they are lowered onto the contours of the truck. The truck is wider at the front than at the back. The blocks are lowered and placed together at the front of the truck using the roller-lined core as a support. As the truck moves and the core becomes thinner at the rear, the blocks slide closer together and lock into place. It is likened very much to the action a zipper makes when it is done up. No mortar is required and there is no curing time. example of Lego-like building construction. The arches are durable and fit together like glue.